La Tee Da Scents of Spring Trio - 32 oz. In addition to lamps and lamp fuel, we also offer La-Tee-Da's flameless fragrance generator called the Aromalume. 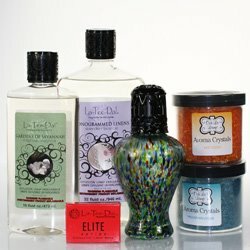 Try La-Tee-Da's "Potion" which is a no-mess, water based product for use in tart warmers. And the latest sensation from La-Tee-Da is the Ooh La Lamp, which is another flameless way to enjoy wonderful La-Tee-Da fragrances in settings where flame isn't welcome, including dorms, offices, classrooms, assisted living centers, and more.